2202 Trail of the Madrones (also shown above) was designed by Sago International a firm headed up by Erik Gonzalez. I love all the stuff that Sago International does, but what really strikes me about this particular home is how quintessential International Style the home is. It's hard to look at that elevation and not see hints of Villa Savoy. FAB Architecture shows us how to do East Austin infill right with this minimal but warm modern home. I love the material pallet that FAB uses that keeps the space looking clean and stark but not sterile. I've been meaning to get inside this house for a while now. I love a good remodel. It requires a bit more creativity to work within the parameters of the existing house and transform it into something new and useful. Baldridge Architects has done some great work, so I'm excited to see how they transformed this 1950's home. I'm also on the lookout for some pool inspiration. 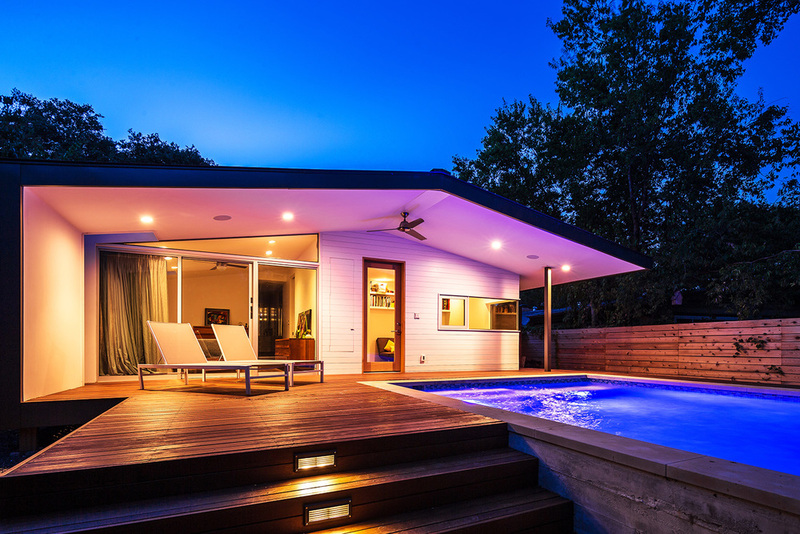 All photos via http://modernhometouraustin.com and North Arrow Studio.